Yesterday evening (US time), while I was peacefully sleeping in Europe, Cassandra Clare treated her fans to something very special. Five years after the epic finale to her The Infernal Devices trilogy (March 19, 2013), Cassie wrote a tumblr post about Will Herondale and Tessa Gray, one of the main TID ships, and I’m sure the following is something that many, many fans are going to love and appreciate. I decided a while ago to pen a little tale of Will and Tessa’s wedding and wedding night. It wound up being a riff on Sleeping Beauty, and taking me quite a while (since I’m writing…four…books at the same time) but I thought I’d share the beginning and post the rest in installments. Warnings for romancey business and not knowing how often I’ll update. Today will be the happiest day the two of you will ever have together. Will Herondale sat in the window of his new bedroom and looked out at a London frozen under a chilly winter sky. Snow dusted the tops of houses reaching away toward the pale ribbon of the Thames, giving the view the feeling of a fairytale. Though at the moment, Will was not feeling very friendly toward fairytales. He ought to be happy, he knew that much — after all, it was his wedding day. And he had been happy, since the moment he’d woken up, even through having Henry, Gabriel and Gideon troop into his room and bother him with advice and jokes while he was getting dressed, all the way up to the end of the ceremony. That was when it had happened. That was why he was sitting on a window seat staring at winter-bitten London instead of downstairs by the fire kissing his wife. His brand new wife. Everything had started out perfectly well. It wasn’t strictly a Shadowhunter wedding, because Tessa wasn’t strictly a Shadowhunter. But Will had decided to wear wedding gear anyway, because he was going to be the head of the London Institute, and his children would be Shadowhunters, and Tessa would run the Institute by his side and be part of all of his Shadowhunter life and they should begin as they meant to go on, in his opinion. Henry, wielding a stele from his Bath chair, helped Will with the runes of love and luck he’d decorated his hands and arms with before he put his shirt and gear jacket on. Gideon and Gabriel joked about what a terrible bargain Tessa was getting in Will, and how they would happily take his place, though the Lightwood brothers were both engaged, and Henry was delightedly married with a small and loudly screaming son, Charles Buford, currently taking up much of his parents’ time and attention. And Will smiled and laughed, and looked in the mirror to make sure his hair didn’t look disgraceful and he thought of Jem, and his heart ached. It was tradition for Shadowhunters to have a suggenes, someone who walked alongside them up the aisle to the marriage ceremony. Usually a sibling or a close friend — and if you had a parabatai, the choice for suggenes was made for you. But Will’s parabatai was a Silent Brother now, and Silent Brothers could not be suggenes. So that place beside Will would remain empty as he walked the floor of the cathedral. Or at least it would look empty to everyone else. To Will, it would be filled with the memory of Jem: Jem’s smile, Jem’s hand on his arm, Jem’s unwavering loyalty. In the mirror, he saw a Will Herondale, nineteen years old, who looked composed and calm: inside his soul breathed grief and love. Until this last year, he had never thought that the heart could hold a full measure of sorrow and happiness at the same time, and yet as he grieved Jem and loved Tessa he felt both in equal parts. He knew she did, too, and it was a comfort to the two of them to be together and share what few others had ever felt, for though Will believed profound grief and profound joy could happen at the same time, as equal love did, he could not believe it was common. “Don’t forget the cane, Will,” said Henry, snapping Will out of his reverie, and he handed Will the dragon-headed cane that had been Jem’s. Will carried it, the jade head smooth under his fingers, as they made their way downstairs and into the heart of the church. Will came in through the back and moved swiftly to the altar, decorated with heaps of white flowers that had come from Idris. They filled the room with a scent that reminded him of Herondale Manor in the Idris countryside, a great pile of golden stone where he and Tessa would now spend summer months. His heart lifted at the thought. It lifted further as he leaned Jem’s cane against the altar and turned to face the room: he had been afraid that the Enclave of London, in their prejudice and bigotry, would avoid the wedding: feelings about the fact that Tessa was half-warlock ranged from indifference to outright coldness. But the pews were filled, and he saw beaming faces throughout: Henry beside Charlotte, who had left baby Charles in the care of Bridget, her hat trembling with a mass of flowers; the recently married Baybrooks, the Highsmiths and Bridgestocks, Sophie moving to make room for Gideon and Gabriel, and even Tatiana Blackthorn, holding the blanket-wrapped bundle of her son, Jesse, and wearing an oddly familiar pink dress. Oh by the Angel, I need a moment to process everything and to wipe away a few tears. 😥 This was so beautiful and the mentions of Jem, how much he is missed by his parabatai, made me so emotional. I hope we are going to get to see him in this short story! Also, what is up with Tatiana? Why is she there? I’m a bit worried! Is she to blame for Will’s unhappy mood? What happened? What do you guys think of this first part? Leave your thoughts, your fangirling in the comments below! Now we definitely know where this unidentified snippet from last year is from! 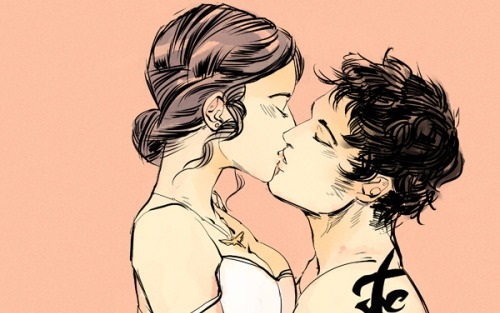 Header by Cassandra Jean. Full art can be found here. When is the next piece out? my heart just swelled and nearly burst ! It’ll most likely be in Chain of Gold. This story sounds like it’s going to be beautiful! Does anyone know where to find the rest of it? The whole story is probably going to be in Chain of Gold. Primo! Waiting eagerly for the rest. The part about Tatiana is strange. I didn’t know that she had conceived a child before Gideon and Gabriel Lightwood’s father turned into a reptilian demon and ate “darling Rupert” Blackthorne. I’m sure Will and Tessa’s married life is going to be addressed in The Last Hours. That was perfect. Can’t wait for the rest.